We are committed to the creation and maintenance of a supportive, enriching, and purposeful community that fosters connection amongst ourselves, others, and the Earth through simplicity, cooperation, and community service. Liberty Village is just outside of Frederick, Maryland amongst sprawling open landscape and farmland. 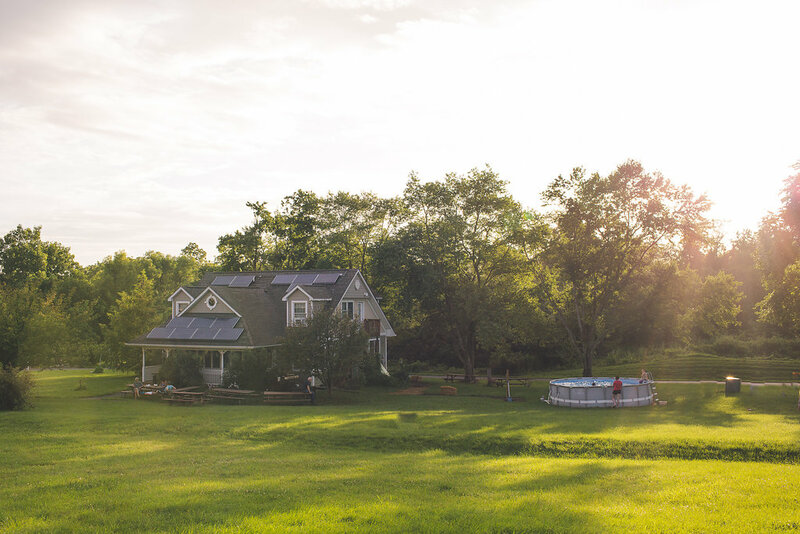 We are located in Libertytown, Maryland which is a peacefully small town with less than 1000 residents and we love being so close to suburbia yet so nicely tucked into a little corner of idyllic cohousing life here. Our village was founded upon the vision of creating a multigenerational living environment that promotes a strong sense of community and a deep-founded respect for our Mother Earth. Residents are committed to interacting with and knowing their neighbors in a meaningful way. Here, different traditions and values are respected, and all can feel that they belong as our residents have diverse backgrounds, occupations, politics, family situations, spiritual/secular paths, and sexual orientations/identities. We are compromised of growing families (currently 20+ children), retirees, singles, and young couples. In the 20 years Liberty Village has been in existence, residents have come and gone, and we have seen many births, deaths, weddings, and so many more life changes. Still, LV continues to be a work in progress so that as our lives evolve and circumstances change, so does the patchwork quilt of the community. We remain a community dedicated to creating a place where resources are shared, the Earth is respected, and our children play together in safety. Our remaining 15 acres of land contain a mix of community gardens, an abundant fruit orchard with pear, apple, and cherry trees alongside blueberry bushes, meadows, woodlands, and wetlands. We have a quiet meditation area in the "way back" for anyone wanting a break or the perfect place to camp and make a small fire for the evening. We forage on wild blackberries, along with red and black raspberries several months through the year. Often we enjoy impromptu dance parties, game nights, s'mores nights, guitar jam sessions, movie nights, and lots of camaraderie with our neighbors and friends. There are free-range, organic pastured chickens which supply us with endless fresh eggs daily, milking goats that supply us with endless entertainment along with fresh milk and cheese, and we hope to add an apiary in the Spring of 2019! We have 10 lots which READY TO BUILD your custom home with new, smaller floor plans for those wanting to downsize and simplify. We would love to meet you and show you what makes us amazing! You can find us on Facebook for the most up to date photographs (We welcome your comments, likes and shares so keep them coming!) and on our website (www.libertyvillage.com) for upcoming calendar events!